Music to Calm Your Canine Companion. If your dog whimpers during a thunderstorm, freaks out when meeting new people, or barks when you leave him at home, now you have a tool to help - without resorting to sedatives. 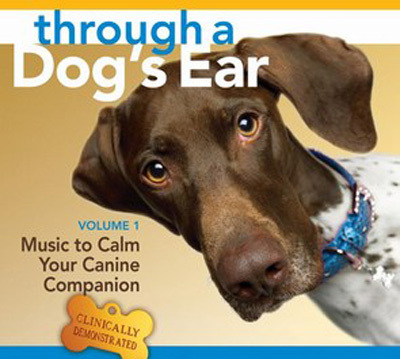 Music to Calm Your Canine Companion is the first CD in a new series of music clinically demonstrated to deeply relax dogs. Based on pioneering research into how the canine nervous system responds to sound, psychoacoustic expert Joshua Leeds and concert pianist Lisa Spector have created music that is twice as effective as conventional classical selections for reduction of canine anxiety behaviours. Research conducted with 150 dogs showed that the psychoacoustically designed classical piano arrangements on this CD induced calmness in 70 percent of dogs in shelters or kennels and 85 percent of dogs in households. Through a Dog’s Ear brings you gentle and timeless music that you can enjoy with your furry companion - and, most important, will help your “best friend” live a happier and healthier life.